More than 8,200 homes rented by the Ministry of Defence for use by military families in England and Wales are unoccupied, the BBC has learned. Figures show 20% of married quarters are empty, but cost taxpayers £28.78m a year in rent paid to a housing company. 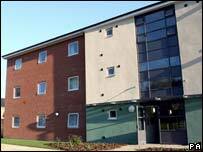 The MoD rents another 1,884 properties from private landlords, at a further cost of £11m per year. The Lib Dems said the figures were "incredible"; the MoD said it was trying to reduce the property surplus. Some of the unoccupied homes have been judged to be in too poor a state to house tenants. In 1996, the Conservative government sold 57,000 married quarters in England and Wales to Annington Homes Ltd. The company now leases 41,000 back to the MoD, which then takes on any maintenance issues. Any surplus stock should be sold off by Annington and the profits shared with the Treasury. But Liberal Democrat defence spokesman Nick Harvey has learned that 8,253 houses are currently empty while rent is still being paid. Mr Harvey told the BBC: "More than a fifth are empty at any one time. That seems extraordinarily high. "One accepts some will be empty while they're organising people to come and go, but it's an incredible percentage that a private sector operator could never sustain." Mr Harvey said the figures were indicative of much wider failings by the government to honour the military covenant. "The whole sorry saga of families' accommodation shows that the nation has not been keeping up its side of the bargain," he said. Defence Minister Derek Twigg told the BBC that he had already held a review into the number of vacant homes. He added: "We keep a large number of properties empty because of movements of the forces. "These are the number of properties we need to have because need to make sure that people have properties to go into." The Ministry of Defence said the 1996 deal with Annington made £1.6bn. "This deal means that the MoD is contractually obliged to pay rent on the homes occupied by service families," a spokesman said. "This equates to an average monthly rent of £300."